“YOU’LL GET USED TO IT” traces a squad of Canadian soldiers and the women in their lives, from the beginning of their enlistment, to the final victory of World War II. From the rambunctious comedy of their boot camp days, to chasing girls in England, to the terrors of D-Day, this play captures the essence of that era through humour, songs, and drama. This musical play was commissioned and dramaturged by Heinar Piller, Artistic Director of The Grand Theatre in London, Ontario, Canada, where it received its premiere. It subsequently transferred to the Performing Theatre Company in Toronto. Since then it has been produced in many other professional regional theatres. A Canadian tour ended in a sold-out run at the Muskoka Festival Theatre. The play was published jointly by Simon & Pierre/The Dundurn Press and is now available through the Playwrights Guild of Canada. 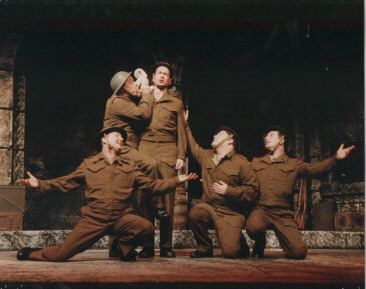 In 2011 Alex Mustakas, the Artistic Director of Canada’s famous Drayton Festival compared The War Show’s power to shows like Big River and Blood Brothers.